A lovely new downloadable (PDF 1.7Mb) knitting pattern to make your own cute cats and sweet kittens. This is a downloadable pdf pattern which you can download immediately and start knitting. A very simple and easy to follow knitting pattern designed for beginner level. Tools you need to make these cuties include 4mm knitting needles, some chunky yarn and some bits and pieces to complete to your taste. 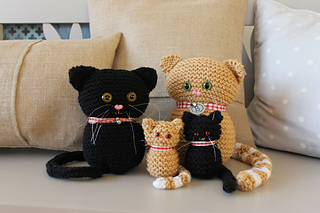 Pattern includes 4 page instructions to make up both cats and the little kittens are made from the left over yarn. This is one of many from our new pattern collection so keep an eye out for new patterns which will be added shortly.